Today marks the start of the Harvest Crusade at Anaheim Stadium! 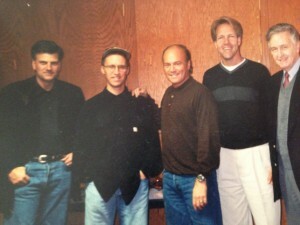 I’m so grateful for what the Lord has done over the years through the Harvest Team and my good friend Greg Laurie. Just happened to find this pic today – a definite “blast from the past!” Franklin Graham (left), Me, Greg Laurie, Skip Heitzig and the great neurosurgeon Dr. Mel Cheatham. The best is yet to come!